vanco_chris has no other items for sale. 2018 Bowman Chrome Bryse Wilson GOLD Refractor Prospect Rookie SP #/50 Braves! 2017 Bowman Chrome Nick Williams GREEN Refractor Prospect Rookie #/99 Phillies! 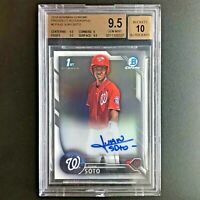 SEAN NEWCOMB 2014 BOWMAN CHROME AUTOGRAPH BGS 9.5 10 AUTO PROSPECT ROOKIE RC!